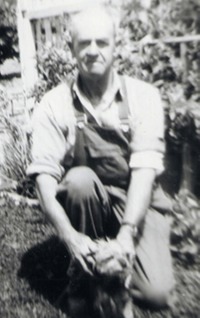 HORACE EDWARD QUALTROUGH, 1905-1988, was the son of EDWARD JAMES QUALTROUGH of Diamond Creek,and ELIZABETH RICHARDS. My father Horace Edward was born on 26/01/05 at Upper Diamond Creek. . I do not know much about his early childhood because he would never talk about it. I do know that he went to school at Diamond Creek, also when I was about 4 or 5 years old, (approximately 1940), I remember visiting Dad’s family home at Wattle Glen, Uncle Bal, was living there alone. I was very frightened when Dad had to turn his Car into the road where the House was, it appeared to me that the home was situated a hill and we had to drive down a rutted track, then stop at a gate, open it, and drive up another hill. One cold, wet, night Dad was turning his car into the driveway at the gate and he got bogged, so Mum had to get out, walk up to the house and get Uncle Bal to come down with a torch and help Dad to get the Car out of the mud. This was during the War and the T Model Ford that Dad was driving had the head lights blacked out, with only a small amount of light shining through a little hole that was cut out of a cover over the lights. I have seen a Photo of Dad and other men, (Relatives I presume) riding Horses, but my Brother has got those Photos. After leaving school he attended the “Working Man’s College” as a Motor Mechanic. Between 1923 and 1925 he was employed by “Smith & Ryan” of 105 Latrobe Street, Melbourne, as a Motor Engineer’s assistant. He left of his own free will, as his health was not very good and he was going to work out in the country. From 13/12/1926 Dad commenced his career with the Victorian Railways as an Engine Cleaner and Fireman at the North Melbourne Loco, but owing to slackness he was stood down on 1/08/1929. While, working here, Dad and Uncle Bal boarded together and as there were no bathing facilities where they lived they used to go to the City Baths for a shower after work. Dad told me that he also worked on laying the Tram Tracks along St Kilda Road, so, maybe he worked here for another 2 years then he rejoined the Victorian Railways again in 1931. During Dad’s Career on the Railways, he worked at the following locations around Victoria:- Stawell, Walhalla, Tutye, Linga, Koyuga, Nandaly, Ravenswood, Bendigo. Mum was Station Mistress at Linga, Koyuga, Nandaly, Ravenswood. Dad had many accidents during his working life because he was required to lay Sleepers, shovel dust from the Railway Tracks etc. He was promoted as Repairer In 1932 and he was transferred to Tutye, this is where all his injuries commenced over the following years. As a Ganger, he was working at the North Bendigo Railway Yards loading Old Railway Lines onto goods trucks to be sent away and attending to derailments, he was injured again. He informed the “Road Forman” and he was sent down to Melbourne to see a Specialist who informed him the owing to all the hard, manual work that he had done over the years he had he had a “Spur” growing out of his Spine and that it had grown back in again, he also told him that as a result of this he had very bad Arthritis. He also had an accident to his eye and was deaf in one of his years. The Victorian Railways never ever gave Dad any Compensation. By the time he retired in 1975 he was stooped right over. All through these years, Dad never gave up, everywhere, we moved to he would plant a Vegetable Garden and grow Fruit Trees. At Koyuga he had a Water Pump and pumped water from the Irrigation Channel which ran at the back of our Railway House, while we lived there he would take us Yabbying in the evening. I have very fond memories of my DAD.